I love the way Emilie writes, I’m on a quest to read all her books .....shhh.. don’t tell her! I design a quilt mystery. She writes a novellini entitled "Treasure Beach" that shares a completely new story about the same characters, set between Fortunate Harbor and the upcoming Sunset Bridge. We give it to you FREE! Brilliant I told her.. Brilliant! 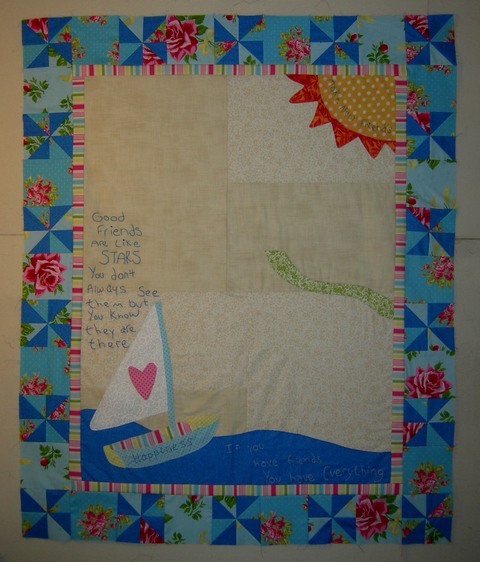 When I went to design the quilt I though about it’s setting.. which is the beaches that both Emilie and I love (she grew up in FL, I on the NJ beaches). It could just as well be your favorite lake or hideway. And as I read the books the true meaning I found was about friendship between women. 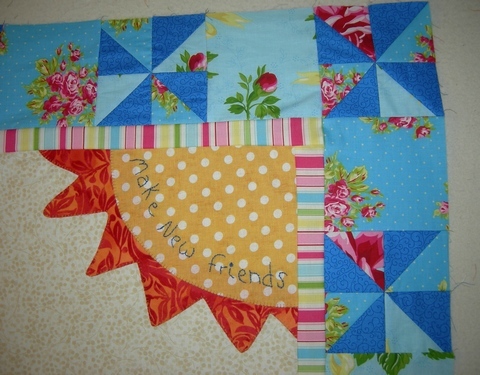 Much like quilters become friends due to a common bond, so do these women. I will START with the completed quilt. What follows is 6 parts to create this quilt. I still think I need to add some buttons to the center of the palm tree.. but it's not happened yet. It didn't happen during this round of photos... wonder when it will? 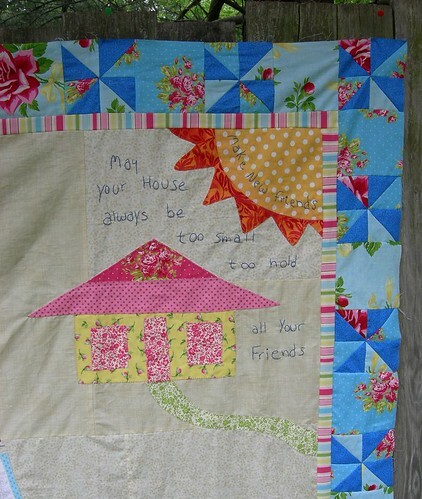 The border was simple to quilt...gets it done! And Mermaids for the backing... I love this fun fabric!!! The patterns follow .. still in the 6 parts... with tutorials ... enjoy! At the end of July we'll pick ONE MORE winner! So Load your quilt to our Flickr Folder. Also Join me at my Forum, where we chat every day! The final chapter of Emilie's Treasure Beach runs each Tues in July! someday we will walk along the beach every morning, how divine! We have TWO options.. as some of you might have your "Happiness Key" by the sea, like Emilie and I. And some of you might have YOUR "Happiness Key" by a lake! And I'd LOVE it if you are in the photo too! take it of yourself... hold out your arm.. you can do it! Load it to our Flickr Folder. MAY winner is Dixie with this photo of her "essence of Happiness Key", I think Dixie is a VERY fun girl indeed! Here we go, Part 4 of Happiness Key! I can't WAIT to see your progress, any progess is good!! And Join me at my Forum! 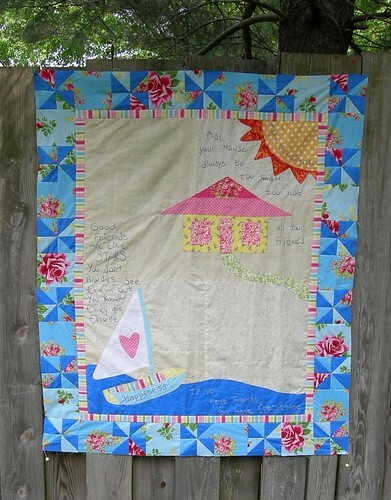 Part 3 of Happiness Key "The Mystery Quilt"
I love this Girl Scout song... Do you remember it? The rest of the song is in the download! SHARE A FAMILY VACATION Photo!!!!! I have many 'stars' in my life, so this quote is just perfect! And there is a March 2011 CHALLENGE! CLICK HERE to the Forum where this is LOADS of fun chatter! I'm using this set of fabric to make my quilt. The Quilt is very inspired by the first novel "Happiness Key" and if you have read it, you know it's about friendship.. keep that in mind! CLICK HERE for PATTERN PART 1! The Final quilt is ﻿﻿﻿36" x 44"
First let me introduce you to the Happiness Key "Decoder Ring". .. made for friends like us! Which character at Happiness Key do you think would wear a ring like this??? Emilie and I want to do several challenges during this project, and a MONTHLY giveaway.. yeah you! Your VERY OWN Happiness Key Decoder ring, JUST LIKE OURS! In honor of Wanda from the series... and because I LOVE pie...you are going to use this Pie applique pattern and put it on a totebag.... any totebag of your choice! tell all your friends about the Mystery.. the more the merrier! Before the 1st Tuesday in March we will pick a winner for Feb.. and announce it on the First Tues post! Starting Feb 8, 2011 and each week for 6 months, Emilie Richards unveils a new part of the Happiness key story.